Background: In cases of portal hypertension with splenic infarcts, splenectomy with proximal splenorenal shunt has been recommended. We are sharing our experience with distal splenorenal shunt in these cases contrary to the popular belief. Materials and Methods: Splenic infarcts were graded as mild, moderate and severe according to the pre-operative CT portogram. Mild, moderate and severe infarcts were defined as an infarct involving < 25%, 25-50% and > 50% area of the spleen, respectively. Mild and moderate infarcts were managed by spleen-preserving distal splenorenal shunt while those with extensive infarcts were subjected to splenectomy and proximal splenorenal shunt. Those with spleen-preserving shunts were closely followed in the post-operative period according to a uniform protocol. Clinical examination was regularly done to assess the size of the spleen and note the presence of pain, tenderness in the left intercostal space. An ultrasound Doppler was done after 7 days to assess shunt patency while CT portogram was repeated at 6 monthly intervals. Results: Fourteen cases with splenic infarcts formed the study group. 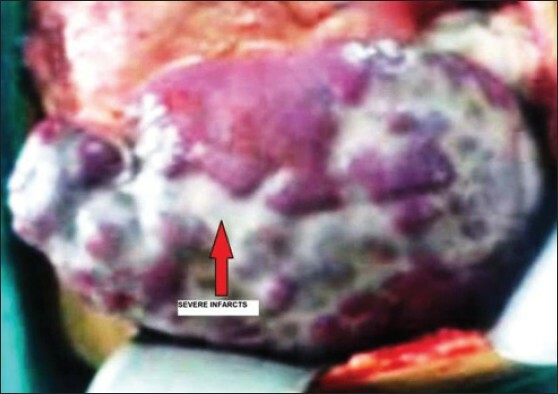 Eight cases had mild infarcts, 3 had moderate infarcts and 3 had severe infarcts. Four underwent proximal splenorenal shunt, and 10 underwent warren's shunt (8 with mild and 2 with moderate infarcts). In 9/10 (90%), spleen could eventually be retained. Spleen completely regressed in them and so did the infarct. Conclusions:Spleen-preserving distal splenorenal shunt can be considered as a viable option in the management of cases with mild and carefully selected moderate splenic infarcts. Extrahepatic portal hypertension (EHPH) is responsible for up to 2/3 of all the cases of paediatric portal hypertension. This is in contrast to the adults where cirrhosis is the most common underlying cause for portal hypertension. , Nonetheless, these children present with similar catastrophic upper gastrointestinal bleed from oesophageal varices. These patients are young, have a preserved liver function, do not have any associated cardiac or renal problems; they tolerate the bleeding episodes well without developing decompensation, coagulopathy or encephalopathy. The natural history of untreated paediatric EHPH has not been well documented. The management of these patients has turned a full circle in the last 40 years. While in 1960's, surgery was the only option available, late 1980's saw the development of endoscopic sclerotherapy (EST), which totally replaced surgery, , in 1990's, a renewed interest has been ushered in the portosystemic shunts as a viable option for paediatric EHPH. ,,, In cases of portal hypertension with splenic infarcts, splenectomy with proximal splenorenal shunt has been recommended. We are sharing our experience with distal splenorenal shunt in these cases contrary to the popular belief. Total of 44 patients were referred for management of upper gastrointestinal bleed secondary to EHPH from 1998 till 2012 and received a portosystemic shunt. Fourteen out of these cases presented with splenic infarcts and they formed the study group. Splenic infarcts were graded as mild, moderate and severe according to the pre-operative CT portogram. Mild infarct was defined as an infarct <25% of the spleen, moderate infarct was defined as infarcts between 25% and 50 % of the spleen while severe infarct was defined as multifocal infarcts or large infarct involving >50% of the area of the spleen. All the patients were operated by the senior author having a fairly long experience of managing portal hypertension of 30 years. Mild infarcts were managed by spleen-preserving distal splenorenal shunt while those with extensive infarcts were subjected to splenectomy and proximal lienorenal (LR) shunt. Cases with moderate infarcts were offered spleen-preserving shunt on the basis of on table decision. Those with spleen-preserving shunts were closely followed in the post-operative period according to a uniform protocol. Clinical examination was regularly done to assess the size of the spleen and note the presence of pain, tenderness in the left intercostal space. 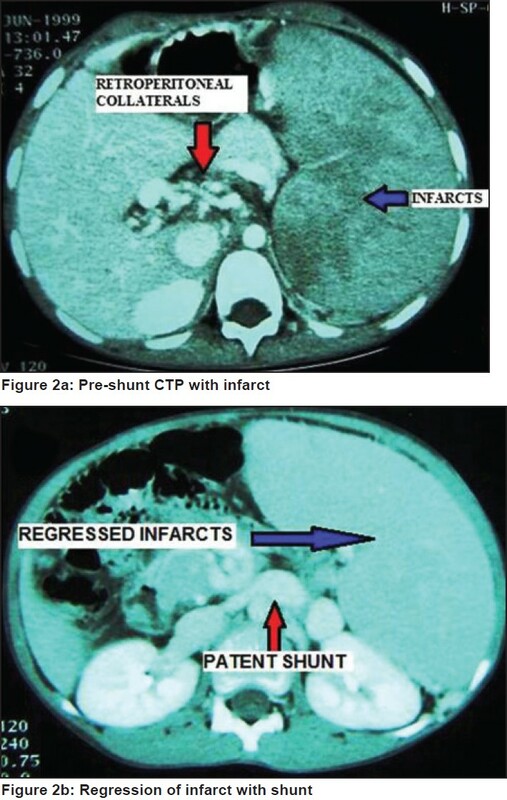 An ultrasound Doppler (USGD) was done after 7 days to assess shunt patency while CT portogram (CTP) was repeated at 6 monthly intervals for first year of follow up to see the status of the infarct and thereafter depending on the symptoms and per abdominal spleen size. Height weight chart was made, and the splenic size was recorded. Secondary intervention (EST) was performed for patients who had re-bleed and a shunt block. Shunt was defined as clinically patent when the patient did not have any GI bleed and the varices had regressed on upper gastrointestinal endoscopy (UGIE); and radiologically patent when it could be visualized unequivocally on either USGD or CTP. Out of the 14 children who formed the study group, 8 were boys and 6 were girls. The age range was 10 months to 12 years with a median of 7 years. The follow-up period ranged from 2 years to 5 years with a mean of 56 months. There was no mortality, and all the children were seen at least once in 3 months. Out of 14 cases 8 cases had mild infarcts, 3 had moderate infarcts and 3 had severe infarcts [Table 1]. Lienorenal shunt (LRS) was performed in 4 patients; distal splenorenal shunt (DSRS) in 10 patients. Patients with very large spleens or with obvious large/multifocal infarcts (total 4) [Figure 1] were not considered for a spleen-preserving shunt and those received a lienorenal shunt. Overall, 12 shunts (85.7%) were found to be patent at follow-up. None of these patients had any GI bleed post-operatively and varices had regressed in all patients, though not completely in some patients. When patency was assessed in context of the type of the shunt procedure; 3/4 (75%) of the LRS, 9/10 (90%) of the DSRS were found patent. Overall, all 12 patients had direct or indirect evidence of patent shunts. Interestingly, in patients who had received a DSRS, the retroperitoneal collaterals did not show any regression while the oesophageal varices and para-oesophageal collaterals had regressed. In patients with the other types of non-selective shunts, the retroperitoneal collaterals regressed in volume. In UGIE, varices regressed to some extent in all 12 patients with patent shunts. Similar findings were seen in congestive gastropathy; it resolved completely in 6 patients and improved in 6 patients with patent shunts. Out of the 10 patients who had undergone a spleen-preserving shunt, 8 had mild infarcts on CT while remaining 2 had moderate infarcts [Figure 2]a. Two cases of moderate infarcts reported on pre-operative CT portogram were offered DSRS as on exploration, the degree of infarct did not correlated with the pre-operative CT and was found to be less than reported. In 9/10 (90%), we were eventually able to retain the spleen (one patient with moderate infarct developed splenic vein thrombosis on post-operative day 2 and required splenectomy). Spleen completely regressed in the remaining 9 patients. Infarcts also completely regressed in these cases in the post-operative CT portogram [Figure 2]b.
Hypersplenism was found in 13 (92.8%) patients pre-operatively, 8 had severe and 5 patients had mild hypersplenism. Four patients with severe hypersplenism received LRS and other 4 DSRS. All the 5 with mild hypersplenism underwent a DSRS. At follow-up, hypersplenism resolved in 12 cases with a resolution rate of 92.30%. We did not encounter any mortality in the present series. Shunt block was seen in 2/14 (14.28%) patients. One of the two has proximal splenorenal shunt done while in another, spleen-preserving shunt was done. Extrahepatic portal venous obstruction is one of the common causes of portal hypertension in childhood; non-cirrhotic portal fibrosis is also among the important causes. Common causes of portal hypertension include extrahepatic portal venous obstruction, non-cirrhotic portal fibrosis, cirrhosis and other causes. Children with EHPH and upper gastro-intestinal bleed present a difficult clinical challenge. Although the sequelae of portal hypertension namely variceal bleed, splenomegaly and hypersplenism are similar to adults, their impacts on the growing child are different. Physiological differences between adults and children may affect the extrapolation of conclusions derived from longitudinal studies in adults for the bleeding risk in a child with EHPH. Hematemesis, ascitis and obvious splenomegaly have been known to be a common presenting symptom among the cases of portal hypertension in children. With the advent and refinement of the endoscopic therapies, they are regarded as the mainstay of the management of variceal bleed in children with EHPH. ,,,, Conventional wisdom states that the children with EHPH stop bleeding as they grow up, but there are no long-term data to support this notion. Proponents of the EST state that the bleeding episodes are not life-threatening in children with EHPH; shunts are difficult and have an associated morbidity of a major surgical procedure. There is also a concern about the chance of hepatic encephalopathy due to a long life span ahead of these children. Our shunt patency rates (85.7%) were similar to other large studies. , Due to apprehensions of attendants to the asplenic state, our emphasis was towards spleen-preserving shunts unless the spleen was very large or contained severe infarcts, in which we observed that splenomegaly might not regress even in patients with patent shunts. Unfortunately, less has been written in the management of cases of portal hypertension with splenic infarcts because of the popularity of splenectomy and proximal splenorenal shunt in the management of these cases. With the emphasis in the spleen preservation, especially in the paediatric age group, it now becomes essential to analyse these cases and form a guideline for their management. Despite of extensive search, we could not find large case series in the management of cases of portal hypertension with splenic infarct. Partial splenectomy  has been done in the management of cases of splenic infarcts due to thrombo-occulsive causes, but there are no reports of any attempt to think for spleen preservation in cases with portal hypertension. We feel that by carefully categorizing them and following them, these cases can be very well managed by spleen-preserving distal splenorenal shunts. In conclusion, we believe that portosystemic shunting in children with EHPH is a viable option. Spleen-preserving distal splenorenal shunt can be considered as a viable option in the management of cases with mild to moderate splenic infarcts. 1. Mitra SK, Kumar V, Datta DV, Rao PN, Sandhu K, Singh GK. Extrahepatic portal venous obstruction: A review of 70 cases. J Pediatr Surg 1978;13:51-4. 2. Dilawari JB, Chawla YK, Ramesh GN, Mitra SK, Walia BN. Endoscopic sclerotherapy in children. J Gastroenterol Hepatol 1989;4:155-60. 3. Howard ER, Stringer MD, Mowat AP. Assessment of injection sclerotherapy in management of 152 children with esophageal varices. Br J Surg 1988;75:404-8. 4. Sarin SK, Misra SP, Singal AK, Thorat V, Broor SL. Endoscpic sclerotherapy for varices in children. J Pediatr Gastroenterol Nutr 1988;7:662-6. 5. Mitra SK, Rao KL, Narasimhan KL, Dilawari JB, Batra YK, Chawla Y, et al. Side to side lienorenal shunt without splenectomy in non-cirrhotic portal hypertension in children. J Pediatr Surg 1993;28:398-402. 6. Orloff MJ, Orloff MS, Rambotti M. Treatment of bleeding esophagogastric varices due to extrahepatic portal hypertension: Results of portosystemic shunts during 35 years. J Pediatr Surg 1994;29:142-54. 7. Maksoud JG, Goncalves ME. Treatment of portal hypertension in children. World J Surg 1994;18:251-8. 8. Shun A, Delaney DP, Martin HC, Henry GM, Stephen M. Portosystemic shunts for pediatric portal hypertension. J Pediatr Surg 1997;32:489-93. 9. Mollesto JP. Variceal bleeding in children. J Pediatr Gastroenterol Nutr 2003;37:538-45. 10. Zargar SA, Yattoo GN, Javid G, Khan BA, Shah AH, Shah NA, et al. Fifteen-year follow-up of endoscopic sclerotherapy in children with extrahepatic portal venous obstruction. J Gastroenterol Hepatol 2004;19:139-45. 11. Bismuth H, Franco D, Alagille D. Portal diversion for portal hypertension in children. The first ninety patients. Ann Surg 1980;192:18-24. 12. Alagille D, Carlier JC, Chiva M, Ziadé R, Ziadé M, Moy F. Long-term neuropsychological outcome in children undergoing portal-systemic shunts for portal venous obstruction without liver disease. J Pediatr Gastroenterol Nutr 1986;5:861-6. 13. Vassia M, Curciarello JO, Corrons F, Viola M, Zamboni E, Castagno M, et al. Idiopathic portal hypertension with splenic infarct. An unreported complication. Acta Gastroenterol Latinoam 2001;31:27-30.